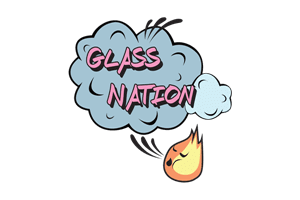 Glass Nation has a robust selection of glass steamroller pipes and even a few extra large steamroller pipes to choose from. Steamrollers are a unique and classic hand pipe style. The way steamrollers are different from a Chillum or traditional spoon pipe is their unique bowl and carburetor placement. A steamroller is essentially a tube with a flower bowl in the center and two holes on each end of the tube. Mouth goes on one end and finger goes on the other end to stem airflow, while taking a draw. Additionally, glass steamrollers are great for parties and large gatherings. This is because they are often large and thick thus less prone to damage. They also tend to have large bowls, which is what makes them a great party bowl. A steamroller pipe is definitely something to write home about. Scroll down to see our large and growing selection of pipes.